I have always loved dogs since I can remember. I especially have a soft spot for Service animals. They are a very special select group of canines. Did you know they begin their two year training from day 1 as puppies? I once asked a trainer who had a puppy “in training” if every dog is chosen. She said “No, many of the dogs aren’t chosen to carry on the specialized training required”. Very interesting. Offer comfort for PTSD sufferers having an anxiety attack. These hardworking animals and their handlers would like us to be aware of the following etiquette if we or our children should have an encounter. When you see a handler with her dog, know that her animal is providing a vital service even if it’s not obvious. Let the dog alone to do her job. 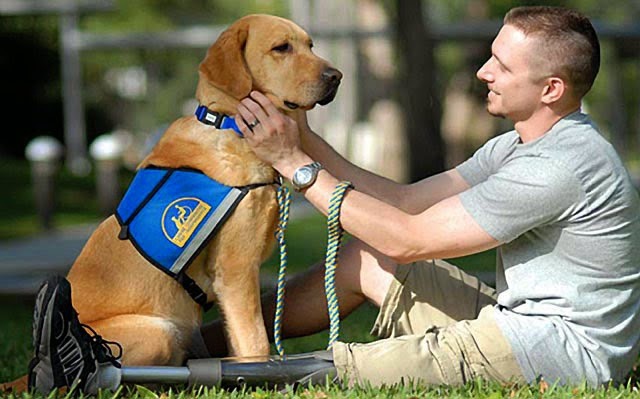 Handlers often refer to their service animals as partners which is so true. Please refrain from touching the dog or even approaching the animal. Just ignore them both unless the handler smiles first and says, “Hi”!! Often the dog is the link between life and death for some handlers. Even if the dog seems to be “not working”, you don’t know the exact nature of the training involved. Perhaps the dog is detecting a epileptic seizure, for example. Any distractions for the dog could be life-threatening!! If it’s not intuitively obvious why a handler has a service animal, definitely don’t ask any nosy questions. “So what happened to you?” “Why do you have an animal?” The medical history of the person is totally off limits. Never be offended if a handler seems unfriendly. Likely, he has fielded lots of questions about his animal. For example, the breed; the training of the animal; the length of time of training; the age. The person may want to run a quick errand or get to an appointment so let’s be respectful of their time. Unfortunately, some people remark to handlers that they feel “sorry” for the animal having to work all of the time. This is simply not true, of course. Handlers deeply love their animals and give them “time off” to be a dog. Lots of time at a dog park along with treats are part of their daily routine. These canines are incredible pets due to their high level of training and socialization. Another reason why service animals are never touched is because they are necessary for the life of the handler much like a wheelchair or white cane is for other people with disabilities. Check out our Etiquette for Kids store! Take the email ettiquette pledge. This Pledge is for those who have the voice to stand up for the importance of taking the time to show courtesy, to spell check, to say Hi and Thank You! in e-mails. Join our bi-monthly newsletter to receive FREE fashion and style tips and info on upcoming classes for kids, teens and young adults. You may unsubscribe at any time by calling +1 403-390-8883, emailing Maria@Leadership-Matters.biz, or clicking the unsubscribe link at the bottom of the newsletter email. Maria was very organized in our shopping trip together. She had the store put aside some items for me to try on. This made our time run more efficiently. Maria even encouraged me to try some items that I never would have considered much to my happy surprise. And the best part, she kept well within my budget. I’d highly recommend shopping with Maria. Her positive attitude and keen eye for flattering styles made our trip a great success. Copyright © 2019 Maria Doll, Leadership Matters 2014. All rights reserved. 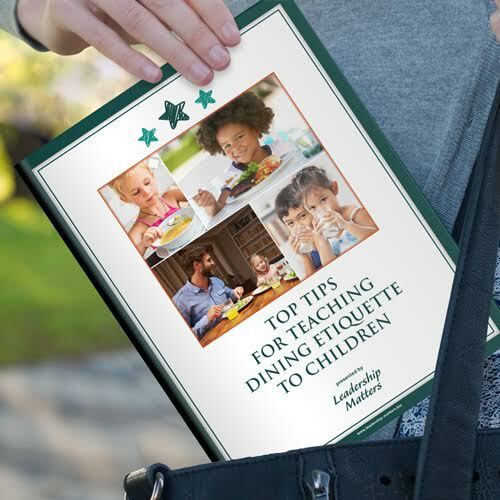 Sign up today for a FREE e-book "Teaching Children Dining Manners! Join our monthly newsletter and follow out blog for etiquette and business tips. Check your email for you FREE eBook gift. You may unsubscribe at any time by calling +1 (403) 390-8883, emailing Maria@Leadership-Matters.biz, or clicking the unsubscribe link at the bottom of every newsletter email.